The National Collegiate Hockey Conference (NCHC) and Xcel Energy Center are offering fans a new opportunity to win tickets to the conference's annual Frozen Faceoff tournament through a contest dubbed the "Pick Your Frozen Faceoff" Sweepstakes. Fans who enter will have a chance to win two all-session ticket packages to the 2020 NCHC Frozen Faceoff. 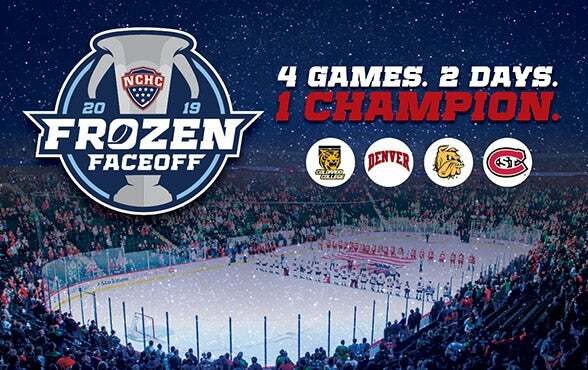 The sweepstakes involves fans predicting the four NCHC teams that they believe will make it to the 2019 NCHC Frozen Faceoff on March 22-23. Next, fans select the two teams predicted to make the Championship game and the 2019 NCHC Frozen Faceoff champion. The final question requires fans to guess how many total goals will be scored during all games of the 2019 NCHC Frozen Faceoff. Fans can submit their predictions through an online entry and are limited to one entry per person. The sweepstakes entry period begins today, Monday, Feb. 18 and ends on Thursday, March 14, 2019. For complete rules of the "Pick Your Frozen Faceoff" Sweepstakes and to enter the contest by mail, click here. The 2019 NCHC Frozen Faceoff is hosted at Xcel Energy Center in Saint Paul, Minn. on March 22-23. All-session ticket packages and single session tickets are on sale now. Fans can purchase tickets to the tournament through ticketmaster.com.